This is a license agreement whereby a property owner licenses the property to a parking lot operator who manages the parking lot operation. The licensee pays the owner (licensor) fixed and percentage rent. This PARKING LICENSE AGREEMENT (“License” or “Agreement”) is made as of _________________, by and between COMMERCIAL PROPERTY LICENSOR, INC., a __________________ corporation (“Licensor”), and AGREEABLE PARKING LICENSEE, INC., a _________________ corporation (“Licensee”). 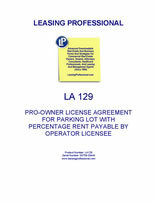 LICENSEE desires to enter into a parking license for certain property owned by Licensor located at __________________________ , State of __________ (referred to as the “Property”, “licensed premises”, or the “leased premises”), and desires to use the parking spaces in the leased premises, together with common ingress and egress serving the entire parking lot. 1. License. Licensor licenses to Licensee and Licensee licenses from Licensor __________ parking spaces as shown on "Exhibit A" attached and referred to from time to time herein as the Parking Spaces. 2. Purpose. Licensee shall be permitted to use the Parking Spaces for the parking of passenger automobiles, subject to the provisions of this License. 3. Term. The term of this License shall commence with the date of this Agreement and end the ____ day of _________, 20__. 4. Renewal. This License shall renew at the end of the term if Licensor and Licensee can mutually agree upon the rental and other conditions for the renewal of the License not less than ninety (90) days prior to the expiration of the term as provided above, which must also conform to the requirements of the municipality. i. $_______ per month ($_____ per month for _____ spaces @ $_____ per space). (i) In addition to the minimum rental specified herein, Licensee will pay to Licensor at the times and in the manner specified herein as additional rental a percentage of Licensee’s gross sales equal to ________ percent (___%) of Licensee’s monthly gross sales. (ii) The term “gross sales” as used herein shall include the entire gross cash receipts of every kind and nature from sales and services made in, upon or from the licensed premises, and every department operating within the licensed premises, whether operated by Licensee, or by a permitted sublicensee, or by a concessionaire or concessionaires, excepting therefrom any rebates and/or refunds to customers, and the amount of all sales tax or similar tax receipts which have to be accounted for by Licensee to any government or governmental agency. Licensee shall use its best efforts to collect all credit sales as soon as possible after such sales are made. (iii) Within twenty (20) days after the end of each month of the term hereof, commencing with the twentieth (20th) day following the end of the first month of the term hereof and ending with the twentieth (20th) day of the month next succeeding the last month of the licensed term, Licensee shall furnish to Licensor a statement in writing, certified by Licensee to be correct, showing the total gross sales made in, from or upon the licensed premises during the preceding month, and shall accompany each statement with a payment to Licensor equal to the percentage rental due. (iv) The Licensee shall keep full, complete and proper books, records and accounts of its daily gross sales, both for cash and on credit, for the licensed premises. The Licensor and Licensor’s agents and employees shall have the right at any and all times, during regular business hours, to examine and inspect all of the books and records of the Licensee pertaining to the business of the Licensee conducted in, from or upon the licensed premises which Licensee shall produce by demand by Licensor or his agents from the purpose of investigating and verifying the accuracy of any statement of gross sales. Licensee shall submit to Licensor copies of all sales tax reports prepared for any governmental authority, within five (5) days of their due date. Licensee shall further submit to Licensor copies of any audit performed by a certified public accountant (CPA) upon Licensee’s books and records, within five (5) days following the date that such audit is completed by such CPA. The Licensor may once in any License year cause an audit of the gross sales of Licensee to be made by an independent certified public accountant of Licensor’s selection, and if the statements of gross sales previously made to Licensor by Licensee shall be found to understate Licensee’s gross sales by two percent (2%) or more than the amount of Licensee’s gross sales shown by such audit, Licensee shall immediately pay to Licensor the cost of such audit, as well as the additional rental shown to be payable by Licensee to Licensor; otherwise, the cost of such items shall be paid by Licensor. (v) The acceptance by Licensor of any sums paid to Licensor by Licensee as additional rental for the leased premises shall not be an admission of the accuracy of the monthly statements furnished by Licensee during the year reported therein, or of the sufficiency of the amount of such additional rental payment, but Licensor shall be entitled at any time within four (4) years after the receipt of any such additional rental payment to question the sufficiency of the amount thereof and/or the accuracy of the statement or statements furnished by Licensee to justify such amount. Licensee shall, for such period of four (4) years after submission to Licensor of any such statement, keep safe and intact all of Licensee's records, books, parking ticket stubs, accounts and other data which in any way relate to or are required to establish in detail Licensee’s gross sales and any authorized deductions therefrom as shown by any such statement, and shall upon request make the same available to Licensor, Licensor’s auditor, representative, or agent for examination at any time during such four (4) year period. (vi) Licensee shall continuously during the entire term, conduct and carry on Licensee’s business in the leased premises, and shall keep the premises open during the business hours and cause Licensee’s business to be conducted therein during the business hours of each and every business day as specified by Licensor from time to time for the premises; provided, however, that this provision shall not apply if Licensee’s business shall be temporarily shut down on account of strikes, lockouts or causes beyond the control of Licensee. Licensee shall keep the leased premises adequately operated with sufficient personnel to care for the patronage and conduct of such business in accordance with good business practices. In the event Licensee does not so operate its business as specified herein, then Licensee shall pay Licensor, as additional rent, one-thirtieth (1/30th) of the monthly minimum rental for each day Licensee does not so operate. Such payment shall be in addition to the monthly minimum rental herein provided and shall compensate Licensor for the loss of percentage rental caused by Licensee’s failure to so operate. 6. Payment of Rent. The minimum monthly rent shall be paid in advance on or before the first day of each month under this Agreement, without deduction or offset of any kind whatsoever. 7. Entry by Licensor. On reasonable notice, Licensor may enter the space to provide services, inspect, repair, improve or show it. Licensee must notify Licensor if Licensee will be away for ten (10) days or more. In case of emergency or Licensee's absence, Licensor may enter the space without Licensee's consent. To the extent possible, entrance will be made without disrupting Licensee’s activities.